Josh Brookes on the Superbike rostrum at the North West 200 in 2014. North West 200 chief Mervyn Whyte hopes to strike a deal to bring new PBM Be Wiser Ducati signing Josh Brookes back to the 90th anniversary meeting in 2019. On Wednesday, the Australian was confirmed as the second rider in Paul Bird’s new-look British Superbike team for next season alongside MotoGP star Scott Redding, when the pair will race the latest factory-backed Ducati V4 machines. 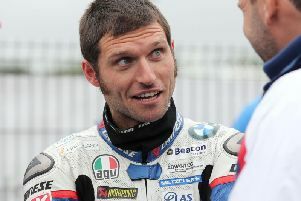 Carrick's Glenn Irwin has won the last three Superbike races at the North West 200 on the PBM Be Wiser Ducati. NW200 Event Director Whyte said he would make the short trip over to the final BSB round this weekend at Brands Hatch in Kent in an effort to ‘work out a deal’ with team owner Bird and Brookes. “I spoke to Paul Bird recently and he explained that there would changes to his rider line-up for 2019,” said Whyte. “I will be going to Brands Hatch for the final round of the British Superbike Championship this weekend and will speak to both Paul and Josh Brookes about next year’s North West 200. North West 200 Event Director Mervyn Whyte with World Superbike champion Jonathan Rea at the event in May. Carrick’s Glenn Irwin has wowed fans on the booming Ducati at the international road race over the past two years, winning three Superbike races in a row, including a dominant double on the Italian Panigale R back in May. The Ulster rider has joined the JG Speedfit Kawasaki team for 2019 as a replacement for the departing Leon Haslam, who will team up with World Superbike champion Jonathan Rea at Kawasaki. Whether or not Irwin returns to defend his Superbike title on the North Coast next Spring remains to be seen. However, the 28-year-old recently told the News Letter the time might be right to end his participation at the famous international road race and concentrate solely on winning the British Superbike Championship. Aussie Brookes, who clinched the BSB crown in 2015, made his debut at the North West 200 in 2013 with Northern Ireland’s Tyco BMW team. The following year, he finished as the runner-up in the feature Superbike race on the Milwaukee Yamaha behind Michael Dunlop, setting a lap record at 122.957mph.